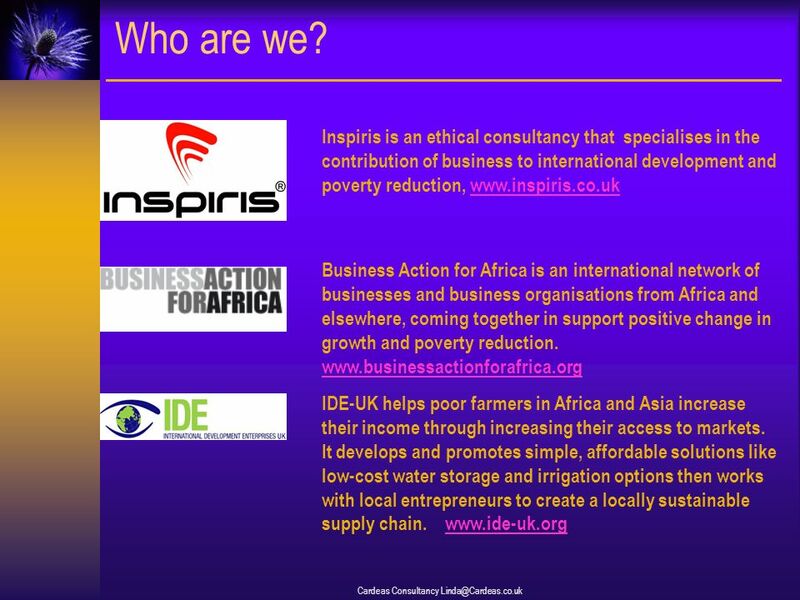 Careas Consultancy Enabling Market Access through Capacity Building & Affordable Solutions Linda MacLeod Brown Chair, IDE-UK & Associate Consultant, Inspiris. 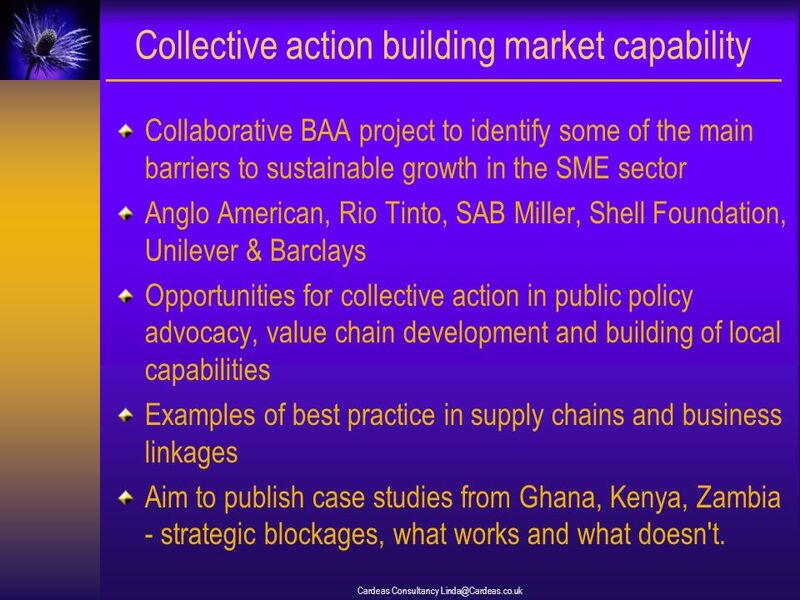 4 Cardeas Consultancy Linda@Cardeas.co.uk Collective action building market capability Collaborative BAA project to identify some of the main barriers to sustainable growth in the SME sector Anglo American, Rio Tinto, SAB Miller, Shell Foundation, Unilever & Barclays Opportunities for collective action in public policy advocacy, value chain development and building of local capabilities Examples of best practice in supply chains and business linkages Aim to publish case studies from Ghana, Kenya, Zambia - strategic blockages, what works and what doesn't. 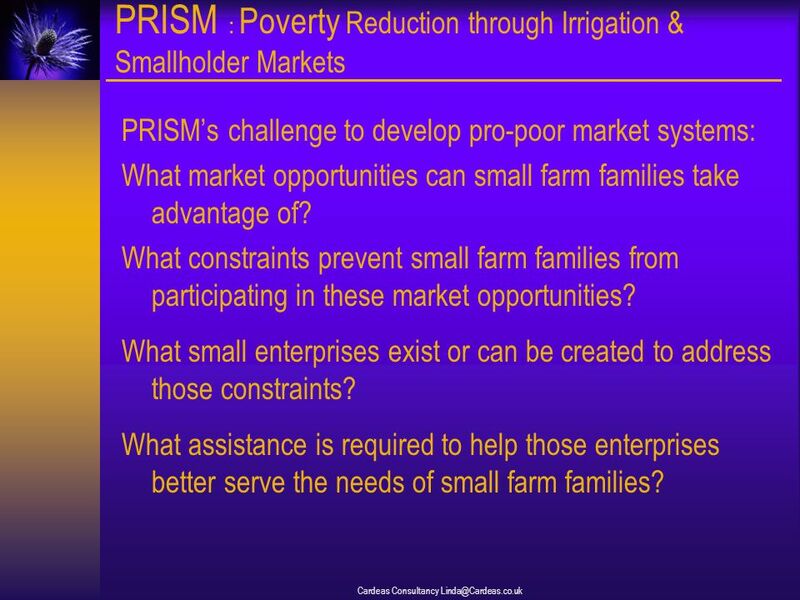 6 PRISM : Poverty Reduction through Irrigation & Smallholder Markets PRISMs challenge to develop pro-poor market systems: What market opportunities can small farm families take advantage of? What constraints prevent small farm families from participating in these market opportunities? 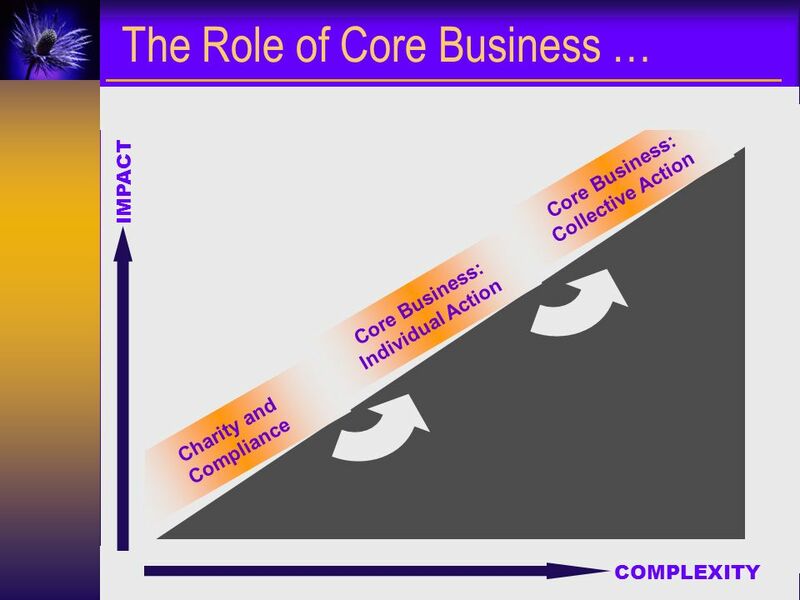 What small enterprises exist or can be created to address those constraints? 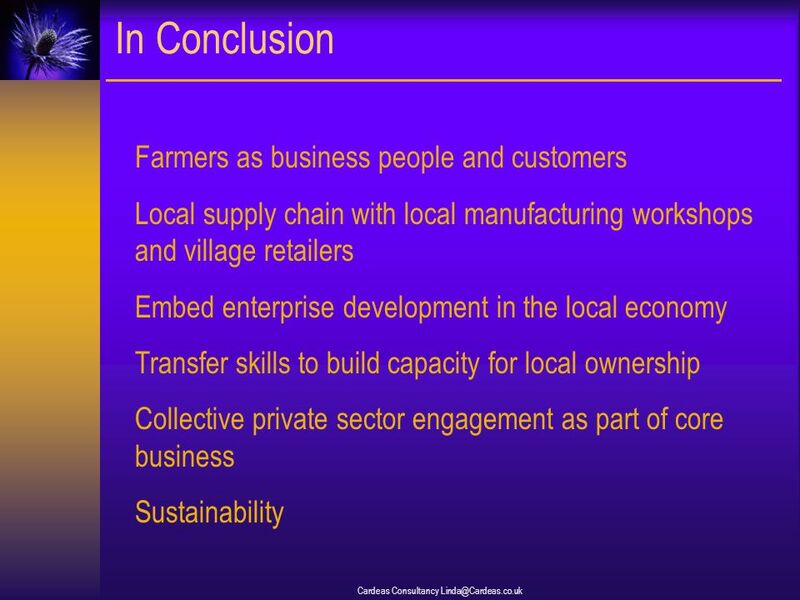 What assistance is required to help those enterprises better serve the needs of small farm families? 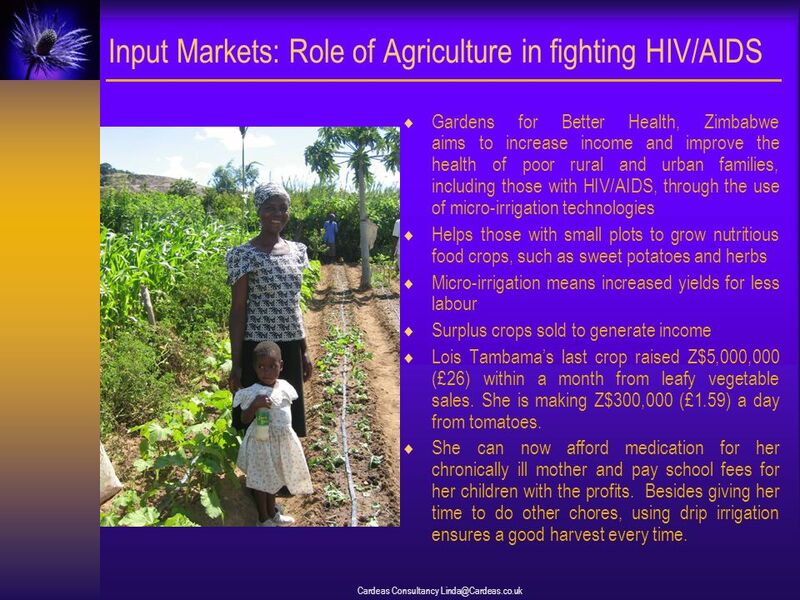 7 Cardeas Consultancy Linda@Cardeas.co.uk Input Markets: Role of Agriculture in fighting HIV/AIDS Gardens for Better Health, Zimbabwe aims to increase income and improve the health of poor rural and urban families, including those with HIV/AIDS, through the use of micro-irrigation technologies Helps those with small plots to grow nutritious food crops, such as sweet potatoes and herbs Micro-irrigation means increased yields for less labour Surplus crops sold to generate income Lois Tambamas last crop raised Z$5,000,000 (£26) within a month from leafy vegetable sales. She is making Z$300,000 (£1.59) a day from tomatoes. She can now afford medication for her chronically ill mother and pay school fees for her children with the profits. Besides giving her time to do other chores, using drip irrigation ensures a good harvest every time. 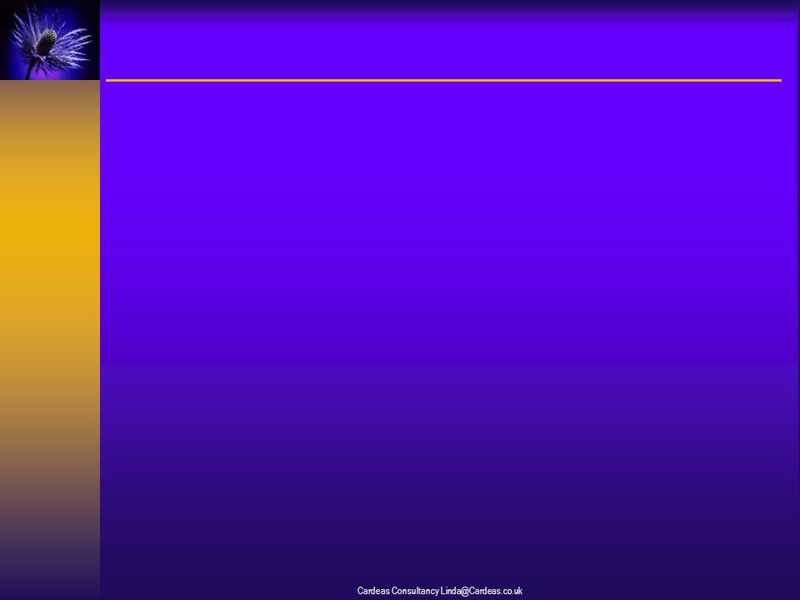 9 Cardeas Consultancy Linda@Cardeas.co.uk Output Markets: Honey & Pepper in Ethiopia IDE has begun research into honey and pepper markets in Ethiopia Smallholders do not have the knowledge, skills or bargaining capacity to maximise the sale of their crops and benefit from market opportunities available. 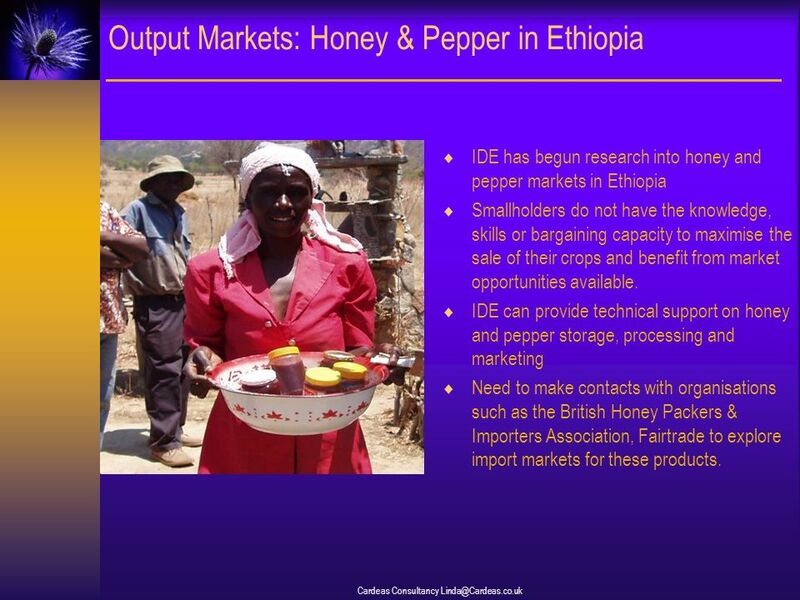 IDE can provide technical support on honey and pepper storage, processing and marketing Need to make contacts with organisations such as the British Honey Packers & Importers Association, Fairtrade to explore import markets for these products. 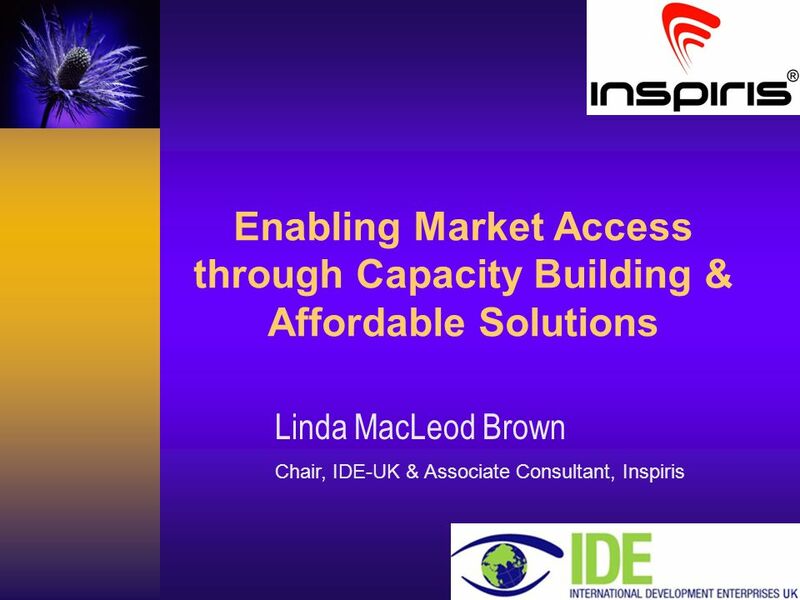 Download ppt "Careas Consultancy Enabling Market Access through Capacity Building & Affordable Solutions Linda MacLeod Brown Chair, IDE-UK & Associate Consultant, Inspiris." Lincolnshire Research Observatory Opportunities for Innovation and Supply Chains in Lincolnshire Opportunities for Supply Chains. Ajai Nair is a Consultant with the Agriculture and Rural Development department of the World Bank He is involved in both analytical and operational work. Market Oriented Extension Service Berhanu Gebremedhin, Scientist, ILRI. Achieving sustainable growth through the CAADP Dr Sloans Chimatiro NEPAD Fisheries Adviser FANRPAN Stakeholders Planning Workshop, Johannesburg 2-4May. Servicing Smallholders for Market Access Ramatu M. Al-Hassan Department of Agricultural Economics & Agribusiness University of Ghana Legon. DEMOGRAPHIC CHANGE (LABOUR/AGEING/YOUNG FARMERS) AND GENDER. 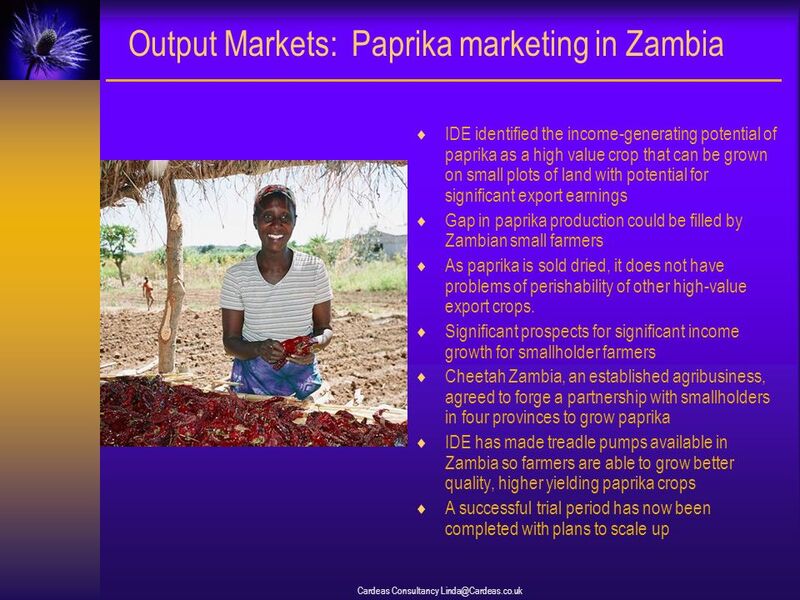 GENDER, AGRICULTURE AND RURAL INFRASTRUCTURE IN SUB-SAHARAN AFRICA BY RUVIMBO MABEZA-CHIMEDZA. Tanzania AGA KHAN FOUNDATION. Aga Khan Foundation Tanzania AKF Tanzania, as part of the Aga Khan Development Network (AKDN), works in collaboration with. HOMESTEAD GARDENING What is new in LRAP? RSDA on behalf of local NGOs. Agricultural Value-chains and Small- Scale Water Development Kailash Sharma Engineering Program Director iDE Nepal. Strawberry Value Chain Market for Poor 20 June 2012 Barda, Azerbaijan. LAND BANK – CELEBRATING 100 YEARS OF FINANCING AGRICULTURE! Presentation of the workshop results to the plenary session A) Strengthening rural entrepreneurship by connecting the local production with other economic. Regional Learning Session on Sustainable and Inclusive Marketing Arrangements Towards Increasing Farmers’ Market Power 9-11 May 2013 Manila Vedini Harishchandra.